Typically, requirements gathering is done through a series of interviews/sessions with the stakeholders to understand the why’s and how’s of the project. 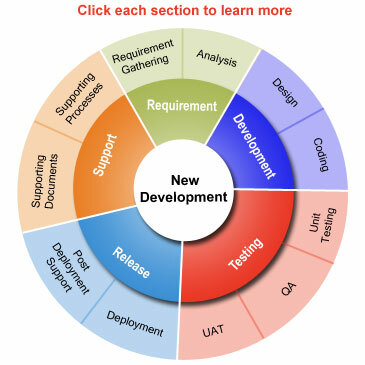 These requirements are documented in theBusiness Requirements Specification. We understand that the most difficult part of requirements gathering is not documenting what the users 'want'; it is the effort of helping users figure out what they 'need' that can be successfully provided within the cost and schedule parameters available to the development team. Therefore, we make sure that the Requirements are actionable, measurable, testable, related to identified business needs or opportunities, and defined to a level of detail sufficient for system design. The analysis starts in parallel with the Requirement gathering so that any ambiguities/confusions are resolved with the client before moving on to development. This also saves on a lot of time spent on review and rework later on. During the Requirement Analysis the Functional and Non-Functional requirements are identified and clearly stated in theSystem Requirements Specifications document. It also includes a set of use cases that describe all of the interactions that the users will have with the software. We also emphasize on review of the Analysis thoroughly internally as well as by the customer. Design is a meaningful engineering representation of something that is to be built. It can be traced to a customer’s requirements and at the same time assessed for quality against a set of predefined criteria. Designing is normally done by the system architect. Just like a house cannot be built without a blue print, a software application cannot be made without a design. Design begins with the requirements model. We work to transform this model into four levels of design detail: the data structure, the system architecture, the interface representation, and the component level detail. Ultimately, a Design Specification is produced. At each stage, software design work products are reviewed for clarity, correctness, completeness, and consistency with the requirements and with one another. Our expert technical team converts the business requirements to the proposed system keeping in mind the organization standards. Use of common components and reusable functionalities make us price competitive. Our technical team always keeps an eye on the latest technologies upgrades to provide best technical solutions. Regular status meetings with customer, proper issue management and documentation process followed here always increases our customer's satisfaction level.